There is just something about the minions that make you smile. I love to watch my kids when they are watching them. They have big grins and lots of giggles that are irresistible. 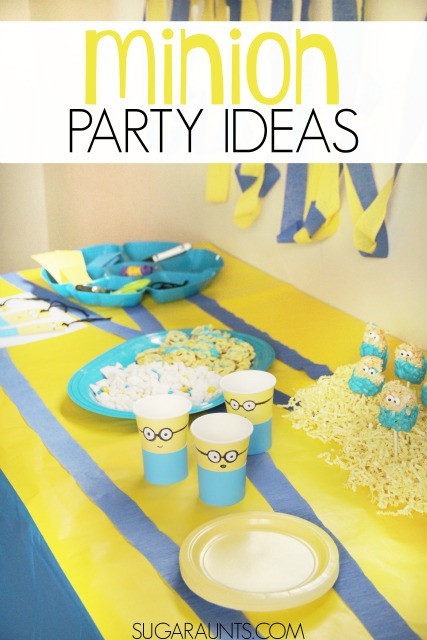 This minion party would be perfect for a Minions movie night party, birthday party, or creative play date. I've got tips and ideas to keep it easy with the BEST and the cutest minion crafts, minion themed food, and minion decorations you will find. I am all about easy party decorations that make a big statement, and putting this minion party together was no exception. The crafts became part of the decor and aside from a few examples, they were mainly made at the party. Easy, right? The other decorations were no-fuss and made a big statement with their simplicity. Minions mean silly fun and that's what our party was all about! 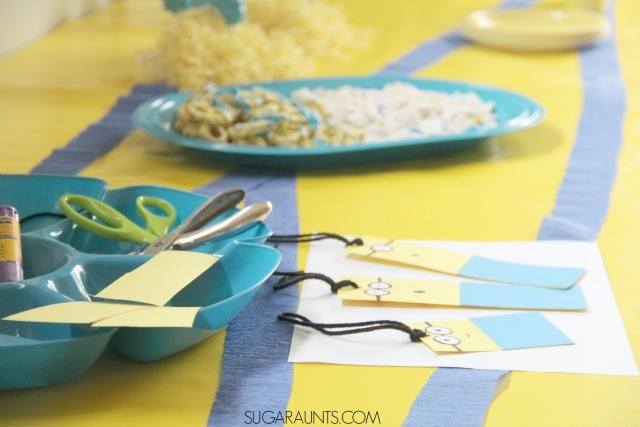 These minion party ideas are so easy, that you will be able to re-create all of the details at home during your Minions movie night. You might know that the latest minions movie was released on 12/8/15. Minions © 2015 Universal Studios. All rights reserved. was a much-anticipated movie release in our house! My kids have been waiting FOR-ever (so they say) to watch this latest release. We were SO excited to celebrate minions and the new movie with our very own minion party. I stopped the store to grab a copy of the Minions movie on Blu-Ray/DVD on the release date and picked up a few essentials to make the best ever minion party to go along with the movie. We love having family movie nights in our house. They are something that my kids really look forward to. Illumination Entertainment's Minions movie was such an anticipated movie for my kids that buying the movie on Blu-Ray/DVD made me smile too, just thinking of how excited they would be to add this movie to our movie night library. When I think minions, I think about their bright yellow and blue colors. So our party table was covered with a bright yellow and blue covering. TIP: Use a blue table cloth draped halfway over the length of the table to create a skirt. You can tape it to the length of the table about half-way across the width. THEN, unroll a tube of yellow gift wrap right on top. The paper gift wrap is a vividly yellow color, just like our minion friends. The back wall of our party table was just rolls of yellow and blue crepe paper taped in swooping waves. My preschooler helped me twist and tape the two colors together to quickly decorate the wall. We then rolled the crepe paper across the length of the table a few times. This task brought out the giggles from my daughter. Who knew that unrolling crepe paper could be so much fun?? To finish up our minion decorations, I grabbed a bag of yellow shredded paper from the store's craft section. It was used around the movie and our snacks. Scatter the shredded paper to fill in gaps on your table and to add texture. And besides the crafts and craft supplies on the table, that's all we did for our decor. My kids helped me make the craft examples for our party. 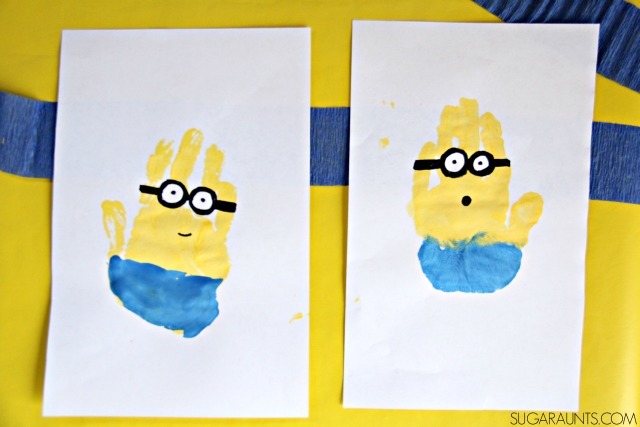 We decided to make minion book marks, minion hand print art, and minion snack cups. Glue the blue rectangle on the yellow rectangle. 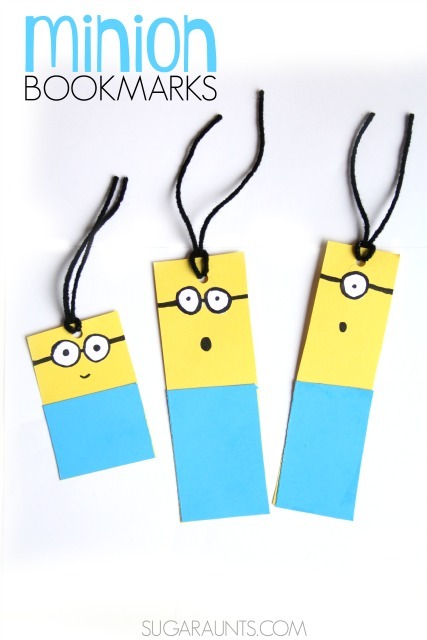 Glue the white circles near the top of the bookmark and trace to make the minion's goggles. Add straps by drawing black lines to each edge of the bookmark. Use the hole punch to punch a hole at the top of they bookmark. Fold the length of black yarn in half. Push the folded middle of the yarn through the hole. 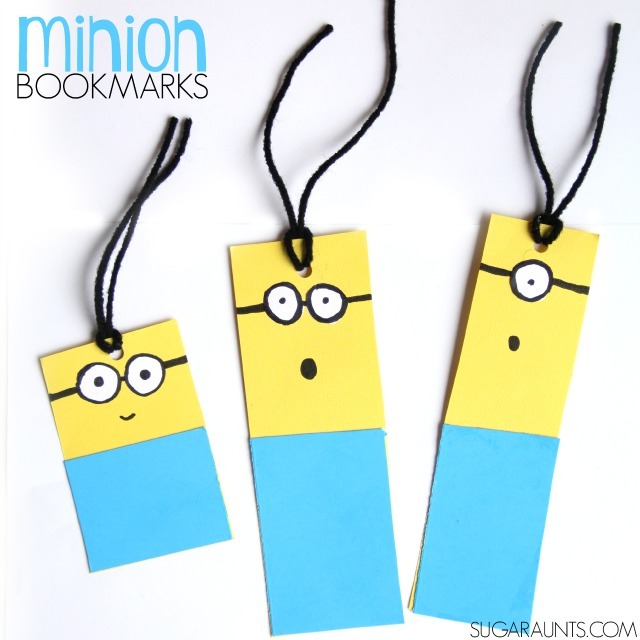 Pull the ends through the loop to create the minion's hair and the top of the bookmark. Place all of the materials you need for the minion bookmark into a sectioned platter and place it on the party table, along with a few examples. 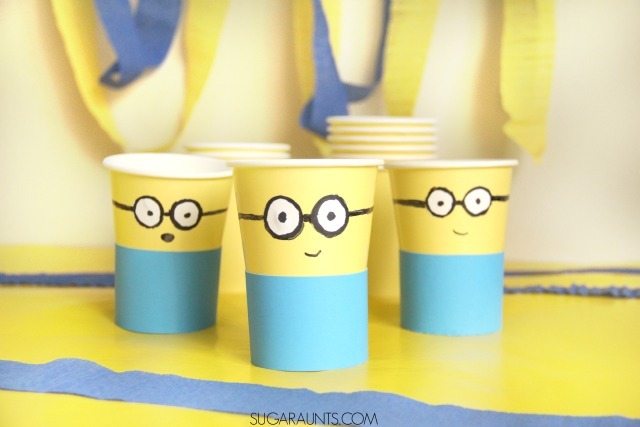 Party go-ers will love to create this fun minion craft during the party. White paper cut into small circles for the eyes. 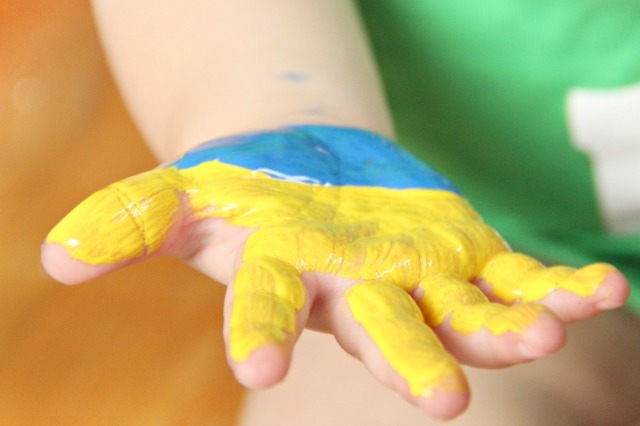 Paint the child's hand yellow on the top and blue on the bottom. Enjoy the giggles from tickle-y paintbrushes on hands. Show the child how to keep their fingers together and how to press straight down on the white paper. Allow the paint to dry. Glue on the white circles to make the minion's eyes. Add the minion's goggles and smile with the black marker. The last craft we made were these snack cups that we used to enjoy our minion themed snacks. Simply tape a rectangle of blue card stock onto yellow paper cups. Glue on white circles for the minion's eyes. Draw the goggles and mouth on with the black marker. Set these snack cups out on the party table for snacking. 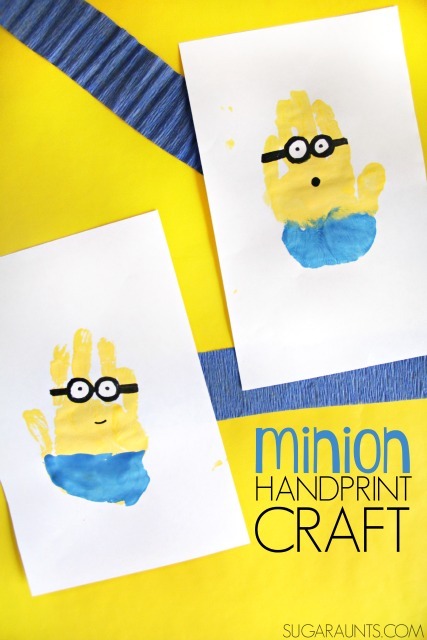 Kids will love to create all of these crafts before watching the movie at your minion party. Everyone needs snacks while watching a movie! 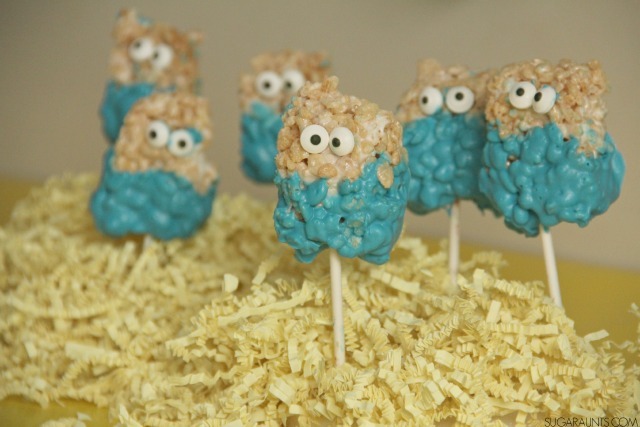 These minion themed snacks will fill hungry bellies after all that crafting. Melt the chocolate melts in the microwave or over the stove top. Stir in the cereal and gently stir until coated. Pour the chocolate covered cereal into a gallon sized plastic bag. Pour the confectioner sugar over the cereal 1/2 cup at a time and shake gently until coated. 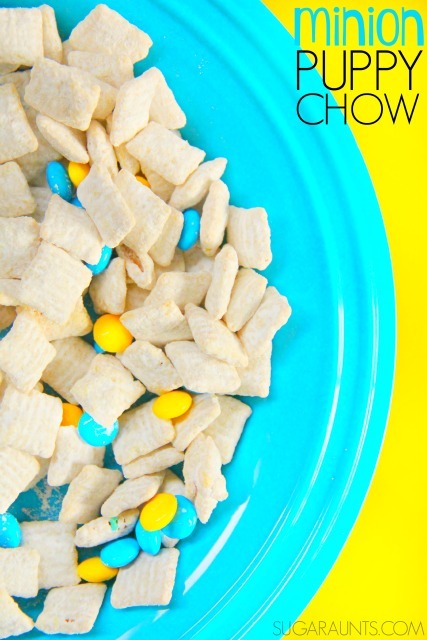 Pour onto a wax paper covered surface and separate the cereal with a fork. Allow the candies to dry and sprinkle in blue and yellow chocolate candies. Press the lollipop sticks into a piece of hard foam to stand up on the party table. Cover the foam with the shredded yellow paper. Add the minion snacks to your snack table and serve them in the minion snack cups at your Minions movie night. They are fun snacks that go along with fun crafts and will make your movie night memorable! 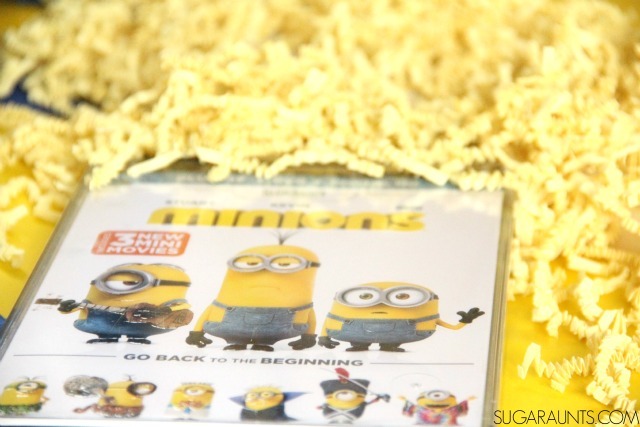 You can easily grab your copy of the Minions movie from the retailers on the Minions movie website. Let me know if you try any of these minion ideas at your party. You can find more creative and fun minion ideas here.